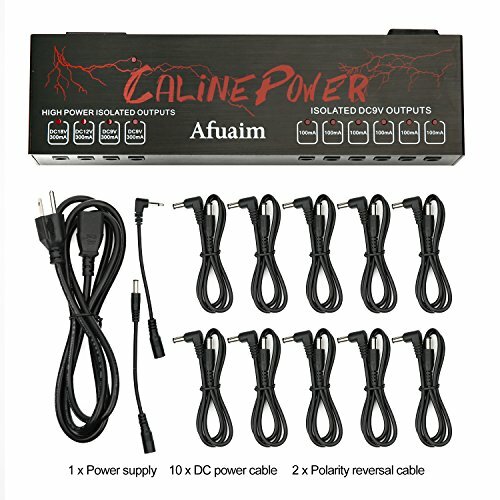 ❤ Afuaim APS-3 guitar effect pedal power supply use high quality loops of wire, make the power supply more powerful and strong capacity to filter and regulate the current. Thus, it supplies stable current to produce perfect tone. ❤ As a multi output power supply, its AC Input voltage rating is 110V AC to 120V AC and 220V AC to 240 AC and it could power for isolated DC 9V, 12V, 18V effects pedal. Short-circuit/ over current protection design make the pedals much safer, short circuit in one channel won't affect other channels' function. Bright blue LED lights will indicate pedal board working status and short circuit. ❤ The power supply housing is made of Aluminium Alloy, which makes it strong and stable also lightweight to be carried to anywhere you want. If you have any questions about this product by Afuaim, contact us by completing and submitting the form below. If you are looking for a specif part number, please include it with your message.